NORINCO CFQ-9 and CFQ-5'8 CFQ stands for the Chinese word CHONG-FENG-QIANG, which in English is simply translated "Submachinegun". The CFQ-9 and CFQ-5'8 represent a new submachinegun cache under development by NORINCO, which launch is expected by 2004. Not much news are known by now, but here them all are. 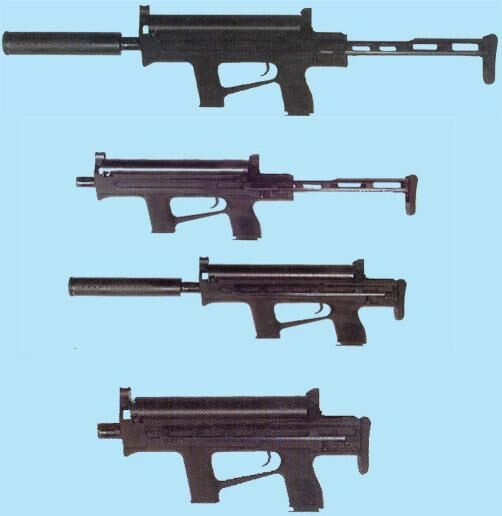 This Weapons System is composed by two identical submachineguns, one chambered for the .9x19mm-Parabellum round, capable either to fire any military grade ammo or civilian standard round or even the extra-powerful DAP-92 Chinese cartridge, and one chambered for the .5'8x21mm-Chi cartridge, Chinese version of the Belgian .5'7x28mm-FN "SS190" armor piercing cartridge. It has a 250 Millimeters long barrel, in both cases, and a collapsing stock that makes the gun be 598 Millimeters long when extended and 398 Millimeters long when collapsed. The CFQ-9 and CFQ-5'8 can both feed by either TWO different systems: a pistol-like, low-capacity magazine (15 rounds for the .9x19mm, 20 rounds for the .5'8x21mm) can be inserted in the grip such as in the UZIs and in the most known submachineguns, OR, a 52-rounder (same ammunition capacity for both cartridge options) helical dispenser tubular magazine, developed from the popular CALICO system, but feeding the gun from the REAR instead than from the FRONT, can be placed on the upper part of the weapon. The CFQ-9 and CFQ-5'8 can both take sound suppressors. More details to follow as them become available.